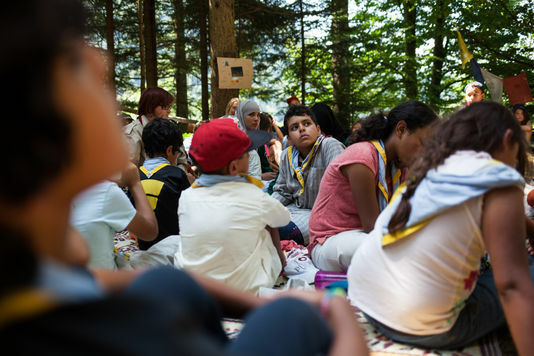 During a whole week, forty scouts aged 7 to 11 from the Muslim Scouts of France (SMF) and the Buddhist-based Nature Scouts (EDLN), also from France, gathered at a summer camp to promote mutual understanding and combat prejudice. At the heart of a beautiful wild valley of Savoy, 800 meters above sea level, the area of Avallon is a high spiritual and historical place that houses since 1980 in the former monastery of Saint Hugon dating from the 12th century, the Karma Ling Institute. The week-long camp at the Karma Ling Institute was a chance for children to ask many questions and to share with others. The various French Scout organisations did not wait for 2015 to develop interfaith programmes but the terrorist attacks of January gives new impetus. 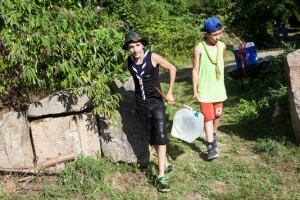 Around twenty meetings are organised this year between young people from different sectors made up by the Federation of French Scouting: interreligious, Catholic, Jewish, Protestant, Muslim and Buddhist. It was a special day for the young Scouts. First of all because those who were ready made their “Scout Promise”, a phase in which a Scout accepts to respect the laws of his movement. But also and especially because the young Buddhist Scouts attended the Friday prayers of the young Muslims as well as the preach of the chaplain, focused on “living-together and nonviolent communication”. Some of them have even participated. They somehow mimicked the ceremonial and prayers in Arabic, in a tent under the open sky. On the last day of the shared Scout camp, a “peace tree” was planted on the site of the Karma Ling Institute.